If you are a marketing-oriented personality and are looking for a part-time business opportunity, explore property tax appeals consulting. In fact, evenings and weekends are perfect to host outreach programs to market such services to the homeowners (i.e., present your unique tax-saving program as compared to the competition’s and signing them up on the spot or via follow-up personal meetings). Every tax jurisdiction offers short windows to allow filing of appeals, both on and offline, followed by face-to-face presentation of (over-assessment) cases to the hearing officers or the assessing staff. Of course, the case presentation generally takes place in weekdays so during that period you have to make yourself available in weekdays (check with your county/town re: the filing and case presentation windows). Assessment cycles are important determinants of appeals so you must know how your jurisdiction’s cycle operates. While 1 to 2-year assessment cycles tend to be more common, 3 to 4-year cycles are not too uncommon either. 1. Inappropriate Market AVMs: Though many consultants started using 3rd party automated valuation model (AVM) values, they do not work well in identifying the over-assessed parcels on the roll as the underlying challenger AVMs tend to be Market AVMs as well. 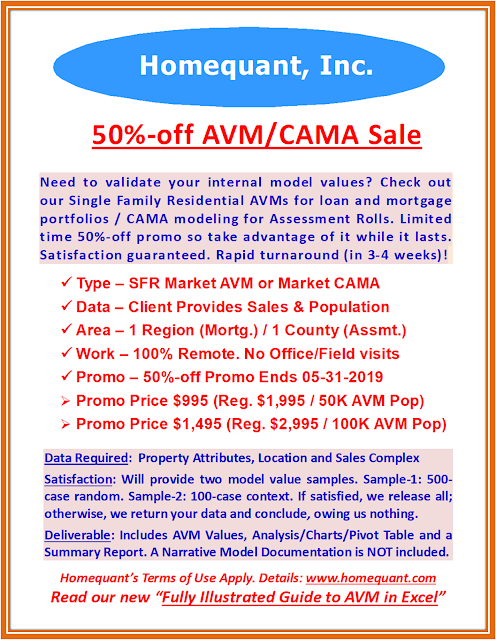 Since the 3rd party AVMs and Assessor AVMs would share very similar modeling sales samples (in terms of the time period, sales significance, etc. ), they produce very similar values, thus essentially validating the tax roll values while costing a lot of money for those values. 2. Flawed Sub-market level AVMs: Many tax roll AVMs are built at the sub-market level, without jurisdiction-wide equalization and/or smoothing, thus distorting values along the sub-market lines. Let’s say Hillside Avenue divides the two sub-markets, despite having very similar, if not identical housing stocks on both sides. Since the two sub-market level modeling samples would be mutually exclusive, the housing stocks on either side would be valued differently. Obviously, if the internal QC fails to identify and correct those inconsistencies, the roll would be palatable to the consultants having access to jurisdiction-wide AVMs. 3. Some Consultants Take More Specialized (Non-AVM) Approach: Of course, there are other consultants who are more specialized in marketing their services; for example, Homes with GIS implications: close to major arteries, backing into the service roads to the highways, industrial areas, etc. ; New Constructions: often, analysts apply basic cost approach rather than market-adjusted cost approach to new homes and subdivisions, thereby inflating their values significantly above the real market; Incomplete Improvements: Instead of applying some token values to incomplete improvements (hence unusable as of the roll date), analysts often apply cost (cost to cure, etc. ), causing the age-old controversy, etc. 4. National Tax Firms Suffer from Similar Shortcomings: While some national tax firms pursue this business via their franchisees or licensees, they suffer from very similar shortcomings. They work with national AVM vendors to ascertain the “meaty” cases. Unfortunately, those are generic market model values, being sold to wide range of users – from banks/mortgages to private mortgage insurances to mortgage reits to tax consultants and others. Considering they are developed off of different sale periods and methodologies, they can produce very different values, not necessarily ideal to determine the accuracy of the tax rolls. Even when the methodology is similar, they are nonetheless market models, thus untenable as good challengers. 5. Law Firms Often Challenge the Assessment Ratio: While some law firms in every jurisdiction represent certain home-owners, their primary focus is the metallurgy of overall assessment ratio (a.k.a., residential assessment ratio or RAR). Since assessment rolls must be fair and equitable, those law firms resort to independent RAR tests, internally or by hiring outside experts. Disputes over RAR, especially after major reassessment, often force tax rolls to the court. The retail consultants, therefore, have limited competition with the local law firms. Of course, the commercial space is a different ball game (and is outside the purview of this blog post). The point is, the methodologies and strategies used by the existing (mass) filers are often based off significant inadequacies (resulting from hit or miss analytics or inappropriate AVMs), paving the way for the old domain to be renewed and reinvented, with more scientific baseline work coupled with creative marketing strategies.